At some point in their lives, investors may receive a large sum of cash, such as a pension payout or inheritance. Finance theory and historical evidence suggest that the best way to invest this sum is all at once according to an investor’s asset allocation. Many investors nevertheless choose to put the money to work over time, a systematic implementation plan that is commonly referred to as dollar-cost averaging. We explore the benefits of both strategies, quantify the costs, and reach three conclusions that can guide decision-making. History and theory support immediate investment. On average, an immediate lump-sum investment has outperformed systematic implementation strategies across global markets. This conclusion is consistent with finance theory, as immediate investment exposes cash to (historically) upward-trending markets for a greater period of time. Systematic implementation provides some protection against regret. Systematic investment of a large sum can be thought of as a risk-reduction strategy. Such an approach can moderate the impact of an immediate market dip. Historically, however, the trade-off has been a lower return in the majority of market scenarios. Systematic implementation strategies temporarily alter your target allocation. In both strategies, total assets end up invested according to the target asset allocation. But the difference between immediate and systematic implementation can have important portfolio implications over the investment interval. If an investor chooses to invest systematically, we recommend keeping the time frame to no longer than one year. In each market, immediate investment led to greater portfolio values approximately two-thirds of the time. 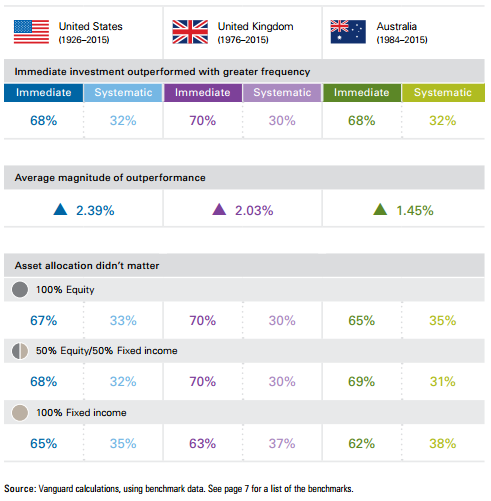 On average, immediate investment outperformed systematic implementation by a high of 2.39 percentage points in the United States and a low of 1.45 percentage points in Australia. These findings are unsurprising. Stocks and bonds have historically produced higher returns than cash, as compensation for their greater risks. By putting a lump sum to work right away, investors have been able to take advantage of these risk premia for a slightly longer period. We also compared immediate and systematic plans over shorter and longer investment intervals using the same 60/40 portfolio. As the interval increased, immediate investment outperformed more frequently. In the United States, for example, immediate investment of a lump sum outperformed a six-month series of investments in approximately 64% of the historical periods. Over a 36-month interval, immediate investment outperformed approximately 92% of the time. Though the data demonstrate that immediate investment has, on average, outperformed, those who choose a systematic investment plan are likely more concerned about worst-case scenarios than averages or probabilities. For investors with a large cash balance on hand, the stakes are high. Out of worry that an investment will quickly lose value, they may gradually ease into the market. Such an approach can minimize feelings of regret by providing short-term, downside protection against a rapid decline in a portfolio’s value. What is the value—and cost—of such protection? To answer this, we ranked the rolling 12-month returns for our balanced portfolios from high to low and divided them into deciles. We then calculated the average returns of immediate and systematic investment plans in each decile. Figure 2 displays the return differences between both strategies in each of our global markets. 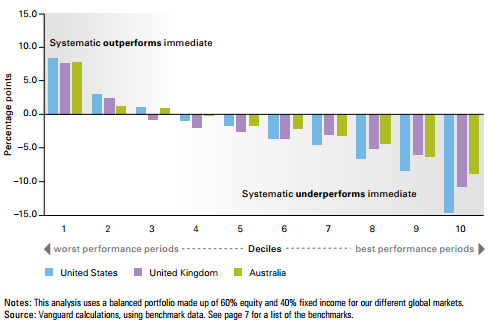 For example, in the worst decile of portfolio performance in each country, an immediate investment underperformed investment over a 12-month period by an average of 8.3% in the United States, 7.7% in the United Kingdom, and 7.8% in Australia. In deciles 1 and 2 (and 3 for the United States and Australia), the higher returns from a systematic investment plan can be thought of as the payoff from such downside protection. The opposite is true in stronger markets. In these cases, the systematic investment’s underperformance can be thought of as the “cost” of such downside protection. These costs may be reasonable if a systematic implementation plan helps an investor overcome any paralyzing fears of regret. The key, of course, is to make sure that the implementation takes place systematically, rather than as a series of separate decisions, each with its own potential for regret. Such an approach imposes the necessary self-control to ensure that the money is fully invested. Abandoning an asset allocation during rough market patches can be incredibly detrimental to the odds of investment success. With either strategy, funds will eventually be invested according to the target asset allocation. However, it’s important to view existing portfolio assets and the cash balance holistically. A systematic implementation plan creates a temporary divergence from the asset allocation into a less risky allocation—a consequence that investors may overlook. Suppose an investor receives a lump sum equal to the existing portfolio’s value. In Figure 3, we show that a 60/40 stock/bond portfolio becomes, temporarily, a 30/20/50 stock/bond/cash portfolio if the lump sum isn’t invested immediately. As discussed earlier, this cash drag that occurs over time is the primary reason that systematic implementation strategies have underperformed on average. In this illustration, the portfolio’s risk exposures during the implementation period are different from the target allocation. This consideration becomes more important with both a longer investment interval and a larger cash balance relative to the portfolio size, as a portfolio will deviate from its intended asset allocation for a longer period of time and with greater magnitude. Though no market fluctuations are factored into this illustration, the conclusions would remain similar if they were. And because there’s a risk that investors may begin to invest-—but fail to fully invest— the cash balance for a number of reasons (including potential feelings of regret), they will be left with a more conservative asset allocation for what can become an extended period of time—or forever. 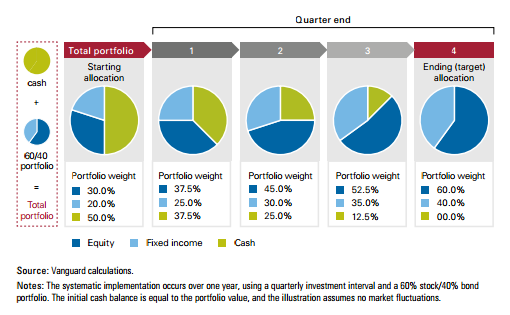 In turn, such an allocation would suggest lower future returns for a portfolio with a greater weight in cash. Determining how best to time the investment of a large cash balance can be a daunting task. Our analysis indicates that investing immediately has historically provided better portfolio returns on average than temporarily holding cash. If we assume that stock and bond markets will continue to provide risk premia above cash, we would expect similar results in the future. For those who choose the systematic approach, we suggest creating a disciplined program to invest the lump sum within a year. This structure ensures that cash is continually invested according to the target asset allocation while limiting the time the balance sits on the sidelines. One example of such a systematic program would be to divide a cash balance into monthly installments and invest in the portfolio according to the target asset allocation, in conjunction with the rebalancing process. Another example would be to immediately invest cash in the less volatile fixed income portion of the portfolio and gradually invest in the more volatile equity portion using a systematic investment plan. Our analysis doesn’t address broader questions that may be raised by a windfall. A big change in an investor’s financial circumstances may alter his or her investment goals and risk preferences. For example, an inheritance may put new financial goals within reach and affect an investor’s ability and willingness to take risk. Consultation with a financial advisor and personal reflection can provide further insight into these questions. 1 These historical percentages and averages should be viewed as a reference point. In a single period, it is possible for either immediate or systematic investment plans to underperform based upon factors such as the prevailing macroeconomic climate and asset allocation. Our analysis uses monthly stock, bond, and cash returns in the United States, United Kingdom, and Australia to evaluate the historical performance of immediate and systematic implementation plans. For immediate implementation, we assume that local currency (USD, GBP, or AUD) is immediately invested into a stock/bond portfolio. For systematic implementation, we assume that the same sum starts in a portfolio of cash investments and is transferred in equal monthly increments into a portfolio over 12 months. Each portfolio consists of a 60% allocation to the local equity market and a 40% allocation to the local bond market using the indexes outlined below. We used total return for our calculations. Both portfolios are rebalanced monthly to the target allocation, and transaction costs are not factored into the analysis. Once the systematic implementation period is complete, both portfolios have identical asset allocations. We then compare the ending portfolio values from each strategy to determine the relative percentage of outperformance and average magnitude of outperformance during rolling 12-month periods from 1926 to 2015 in the United States, 1976 to 2015 in the United Kingdom, and 1984 to 2015 in Australia. The study periods for each market were determined by the availability of reliable and consistent monthly data. In each country, we selected the indexes deemed to best represent the relevant market given available choices. United States. Equities: Standard & Poor’s 90 (January 1926–February 1957), S&P 500 Index (March 1957–December 1974), Wilshire 5000 Index (January 1975–April 2005), MSCI US Broad Market Index (May 2005–December 2015). Bonds: S&P High Grade Corporate Index (January 1926–December 1968), Citigroup High Grade Index (January 1969–December 1972), Lehman Brothers U.S. Long Credit Aa Index (January 1973–December 1975), Bloomberg Barclays U.S. Aggregate Bond Index (January 1976–December 2015). Cash: Ibbotson U.S. 30-Day Treasury Bill Index (January 1926–December 1977), Citigroup 3-Month U.S. Treasury Bill Index (January 1978–December 2015). United Kingdom. Equities: MSCI United Kingdom Index (February 1976–December 1985), FTSE All-Share Index (January 1986–December 2015). Bonds: FTSE British Government Fixed All Stocks Index (February 1976–December 1998), Bloomberg Barclays Sterling Aggregate Index (January 1999–December 2015). Cash: Inferred from UK Interbank 1 Month–LIBOR (February 1976–January 1998), Citigroup World Money Market United Kingdom Sterling 3 Month Euro Deposit Index (February 1998–December 2015). Australia. Equities: S&P/ASX 300 Accumulation Index (January 1984–December 2015). Bonds: UBS Australia Composite Bond Index (January 1984–October 1989), Bloomberg AusBond Composite 0+ Yr Index (November 1989–December 2015). Cash: Australian Dealer Bill 90 Day (January 1984–August 1998), Bloomberg AusBond Bank Bill Index (September 1998–December 2015). References Shtekhman, Anatoly, Christos Tasopoulos, and Brian Wimmer, 2012. Dollar-Cost Averaging Just Means Taking Risk Later. Valley Forge, Pa.: The Vanguard Group.